Today's post is just a quick note to wish you and yours a blessed Thanksgiving. The Design Team and I sincerely hope that you have a wonderful day with family and friends. I pray that the riches of the Lord's grace and mercy be with you and your loved ones. 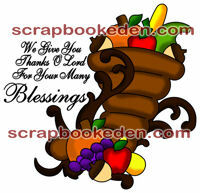 Here is a digital stamp as a token of our gratitude. Thank you for stopping by and allowing us to be a part of your crafting and creative life! If you are a newsletter subscriber, then you will be receiving the cutting file. But be sure to act fast as the digital stamp and cutting file will only be available for FREE until midnight, Saturday, November 27th. Many thanks for the gift of these files and a happy Thanksgiving to you and yours! Thank you so much for the stamp and file. I hope you and your family have a great Thanksgiving. What a great files. Thanks. Happy Thanksgiving to you and thank you for your wonderful files. Happy Thanksgiving to you and yours and many thanks for the free files. Oh gosh you ladies are all more than welcome :-) Thank YOU for being a part of us here at CWC! Happy Thanksgiving. Thank You for all the cut files and digital stamps you have shared with us this year. I appreciate your creativeness. Thanks Melin for the pretty digital stamp and for all you do! Blessings to you and family during this Thanksgiving season! !